This seems like a nasty trick from Logitech. I am talking about my Logitech Cordless Desktop LX 700 but it may also apply to other models. A few weeks ago a customer gave me an old wireless keyboard and mouse. "It does not work and I have bough a new one". Soon afterwards my keyboard began sticking on certain keys. Pouring a large mug of tea over it and then cleaning it did not help and no amount of silicon spray seemed to stop the sticking. Then I remembered the Logitech mouse and keyboard. The keyboard just needed new batteries and the ones on the mouse were dead. As they are rechargeable I removed them and charged them on my battery charger. After that the mouse worked fine as well. But after a few days the mouse suddenly stopped, as I keep forgetting to put it back on the charging cradle when I finish I was not too surprised. 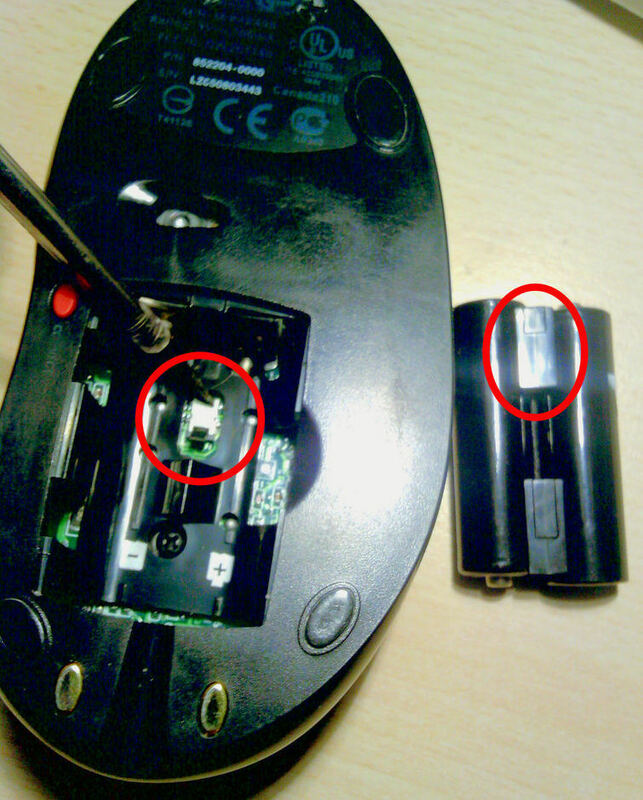 After this happened a few times (and now I was putting the mouse back in the cradle) I decided to swap out the existing batteries (AA) for two rechargeable ones. The Logitech batteries seemed to be glued together with a piece of plastic in the middle. I put in the two new AA batteries and everything was fine. But a few days latter the mouse stopped again - had I put it back in the charger? So I blamed myself and charged the batteries externally again, and again. Today I checked the batteries - OK, the contacts in the cradle - OK, the joints inside of the mouse - OK, the power supply - OK. WHAT COULD IT BE? Then I noticed the a little switch right between the batteries. A switch that would be depressed by that strange plastic between the two original batteries. I cut a small piece of plastic to the right size and made sure it was held in by the batteries. Put the mouse back on the cradle and, for the first time, I noticed a little green LED on the mouse. IT CHARGES.